Over the past decades [the] danger has appeared that foreign interest groups are attempting to utilize the organizations of civil society. Support provided under various titles represent a common vehicle for this [attempt] . . . The purpose of such allocations is for the interest groups that provide them to assert their own interests in the political and social life of Hungary through the social influence of the non-government organizations that receive them [the allocations]. . . . These processes may increasingly threaten Hungary’s national security and sovereignty. . . . The objective of the present law is to discern and make visible which organizations may be regarded as an organization supported from abroad. –Instructed the public prosecutor to initiate the dissolution of those non-governmental organizations that failed to comply with these stipulations following the imposition of fines. *The final draft of the bill stipulated that this requirement pertained only to donations of more than 500,000 forints. Demonstration on Heroes’ Square in Budapest against NGO Law (photo: Népszava). 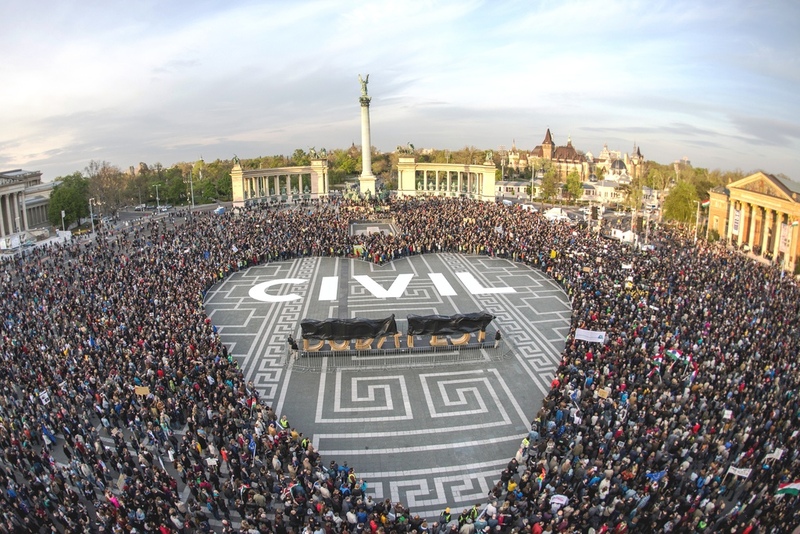 On April 12, 2017, tens of thousands of people protested peacefully against the proposed legislation, which is known in Hungarian as the NGO Law (civil törvény), at a demonstration held on Heroes’ Square in Budapest (source in Hungarian). There are no privileges. Nobody can stand above the law, not even György Soros’s people. I don’t believe that the conservative [polgári] intelligentsia would gladly act in collusion with those about whom it will soon become clear as a result of the law to be adopted: that they are conducting their activities on behalf of foreigners using foreign money and serving foreign interests. The whole thing is about the fact that György Soros supports illegal immigration with a huge amount of money, hidden from the public, through his organizations in Hungary. He pays numerous lobby organizations disguised as NGOs to assert his interests. He maintains a veritable network with its own spokesmen, its own media, with several hundred people, with its own university. He wants to keep pressure on that Hungary which expects a György Soros to comply with its laws. I say that György Soros should not be underestimated. He is a powerful billionaire who is capable of doing anything, who knows neither God nor man if it is a question of his own interests. We want to defend Hungary, that is why we must undertake the struggle. On June 13, 2017, National Assembly representatives approved the Law on the Transparency of Organizations Supported from Abroad by a vote of 130 in favor to 44 against with 24 abstentions. All representatives from the Fidesz–Christian Democratic People’s Party governing coalition voted in favor of the law, while all opposition representatives either voted against the law or abstained (source in Hungarian). On June 16, President János Áder signed the legislation into law (source in Hungarian). Seven non-governmental organizations announced within one month of the adoption of the NGO Law that they would not comply with it. These organizations included the Hungarian Civil Liberties Union (TASZ), the Hungarian Helsinki Committee and Amnesty International Hungary (sources A, B and C in Hungarian). The United States is concerned by the Hungarian parliament’s passage of legislation that unfairly burdens and targets Hungarian civil society, which is working to fight corruption and protect civil liberties. By portraying groups supported with foreign funding as acting against the interests of Hungarian society, this legislation would weaken the ability of Hungarians to organize and address concerns in a legitimate and democratic manner. If signed into law, this would be another step away from Hungary’s commitments to uphold the principles and values that are central to the EU and NATO. The Commission wishes to stress . . . that while on paper certain provisions [of the law] requiring transparency of foreign funding may appear to be in line with the standards [of the Council of Europe], the context surrounding the adoption of the relevant law and specifically a virulent campaign by some state authorities against civil society organisations receiving foreign funding, portraying them as acting against the interests of society, may render such provisions problematic, raising a concern as to whether they breach the prohibition of discrimination, contrary to Article 14 ECHR [European Convention of Human Rights]. In particular, although the label “organisation receiving support from abroad” objectively appears to be more neutral and descriptive compared, in particular, to the label of “foreign agent” [referring to the “foreign agent” law enacted in Russia in 2012], it should be emphasised that placed in the context prevailing in Hungary, marked by strong political statements against associations receiving support from abroad, this label risks stigmatising such organisations, adversely affecting their legitimate activities and having a chilling effect on freedom of expression and association. The Council of Europe is a 47-member international organization that aims to uphold human rights, democracy and the rule of law in Europe and to promote European culture. It is not the same as the European Union, though all members of the EU are also members of the Council of Europe. The Venice Commission of the Council of Europe is an advisory body composed of independent experts in constitutional law. 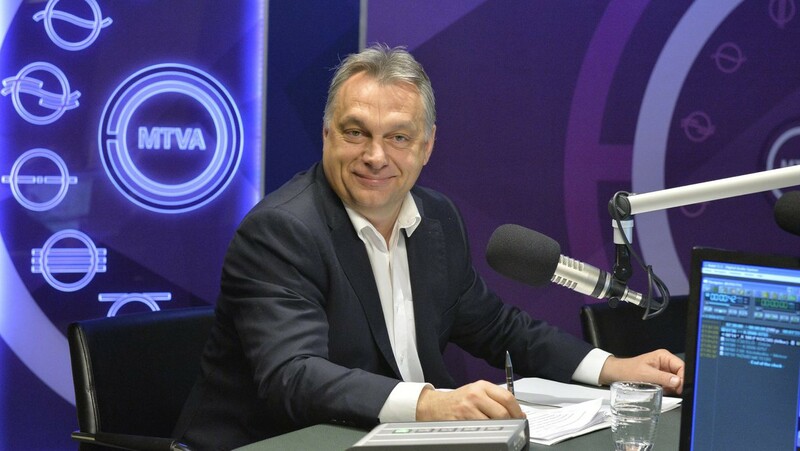 Prime Minister Orbán speaking on Hungarian Radio (photo: hirado.hu). On July 13, 2017, the European Commission (EC) initiated the first step of the three-step European Union infringement procedure against Hungary with regard to the Law on the Transparency of Organizations Supported from Abroad, which the EC determined “interferes unduly with fundamental rights as enshrined in the Charter of Fundamental Rights of the European Union, in particular the right to freedom of association” and “introduces unjustified and disproportionate restrictions to the free movement of capital, as outlined in the Treaty on the Functioning of the European Union” (source in English). This so-called Letter of Formal Notice provided the Orbán government with one month to respond to the European Commission’s objections to the law. On August 14, Justice Ministry State Secretary Pál Völner announced that the Orbán government had formally rejected the European Commission’s objections to the NGO Law on the grounds that the law was “necessary and proportional.” Völlner said that “we can’t help it if the restrictions harm the interests of György Soros” (source in Hungarian). On October 4, the European Commission initiated the second step in European Union infringement procedure against Hungary with regard to the Law on the Transparency of Organizations Supported from Abroad. This so-called Reasoned Opinion provided the Orbán government with one month “to notify the Commission of measures taken to remedy the situation” (source in English). Well now, if one reads the submission of the Brussels bureaucrats regarding the Hungarian NGO law, then all we can say is that it is the subject of ridicule everywhere in Europe. A sensible lawyer would not even pick it up, because it would burn his hands. It smells so much of a document prepared according to a political command, there are such far-fetched arguments in it that a lawyer, how shall I say it, cannot make it the subject of discussion with suitable seriousness, without laughing. It is so ridiculous that nothing can be done with it. The European Commission has not yet initiated the third and final step in European Union infringement procedure—referral to the European Court of Justice— against Hungary with regard to the amendments. On August 30, 2017, 23 non-governmental organizations submitted a joint challenge to the NGO Law to the Constitutional Court. These organizations included all seven organizations that announced that they would not comply with the law (source in Hungarian). Momentum President András Fekete-Győr submitting referendum signatures to the Budapest Election Office in February 2017 (photo: Magyar Nemzet). Momentum announced after the Curia’s decision that the party would soon begin collecting the 200,000 signatures necessary to hold the referendum (source in Hungarian). However, even if Momentum manages to collect the required number of signatures, the referendum will likely occur only after the general election expected to take place in Hungary in April 2018 (source in Hungarian). In early 2017, Momentum collected the required number of signatures to hold a referendum on the Hungarian Olympic Committee’s 2024 Summer Olympics bid, which the Orbán government withdrew before the referendum could be held. Last updated: November 11, 2017.